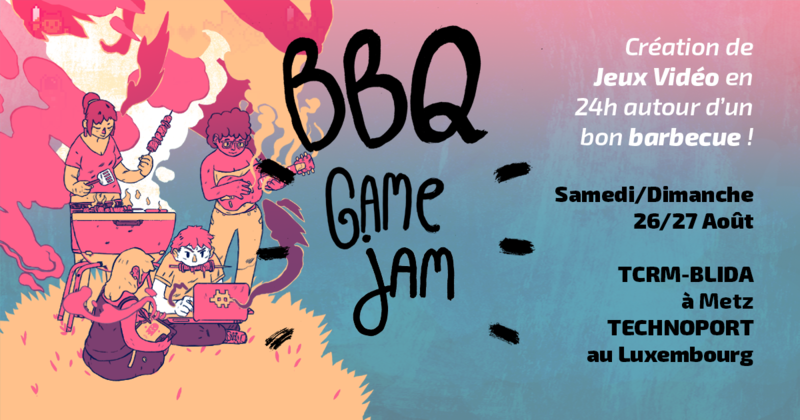 BBQ Game Jam is and IRL game jam setting up in the east of France and Luxembourg. This summer, we invite all creative people, graphical designers, musicians, developers, hackers to participate in a relaxed atmosphere to the Barbecue Game Jam: one day of video game creation accompanied with sun* and grilled stuff! (veggie-friendly =P) This year, you will be able to attend to this game jam on the location of your choice: Technoport in Esch-sur-Alzette, Luxembourg or TCRM-Blida in Metz, France. A crazy 2vs2 players pong-like game !